Images compel us far more than discourses. Even similar images can trigger our subconscious mind. In it we can find more than just our own tastes, we can also find shared hopes and fears, our shared identity, our shared high and popular cultures. Using shared images, about myths, or remarkable things that have happened in history, is not something new. Darius the Great communicated his power through images: sculptures. He started an artistic revolution in which he combined artistic elements throughout his Empire. Off the main road of Persepolis, he decided to picture himself as a bowman. The bow, for the persians, was a symbol of balance and control, key elements for a good king. Alexander the Great used the political portrait heavily using his image as a human strong leader who could defeat anyone. They presented themselves as heroes, as ultimate kings that would bring the final peace to the land uniting all their peoples. Throughout history art has been used as means to communicate power but also communicate shared emotions. Ancient Greece created myths so strong, we still care about them today. Images have been used to trigger shared emotions and behaviors making the viewers empathize with the figures in the image, to the point of identifying with them. Shared culture helps trigger those emotions in the viewer. Those viewers who do not share the same culture, might just see an image, but will not emphasize with it. 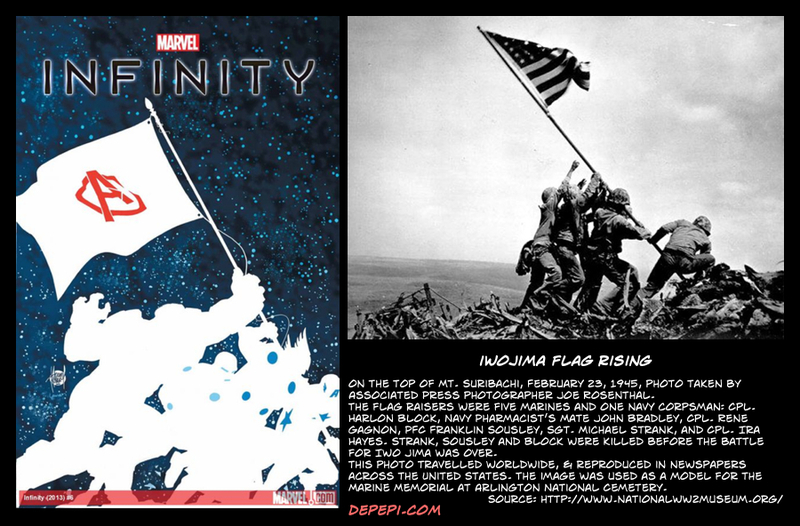 This is what happens with Marvel’s “Infinity” #6 cover and the picture of the Iwojima flag rising. Marvel’s “Infinity” cover is staggering: it shows up the rising of the Avengers flag, by the Avengers, somewhere in the cosmos announcing their victory. If you are to remember Iwojima’s flag rising, odds are that you are going to feel sympathy towards the heroes on the cover. Even if the flag has been captured in different shapes, even if the flag has changed, even if the surroundings have changed you are moved. Take also a closer look to the colors used in the cover: blue, red and white. These are the colors of the American flag. Now notice the background: the night and plenty of stars. Stars are key historical components of the American flag, signifying the union of states: more states in the union, more stars on the flag. This cover directly evokes the photograph of the Iwojima flag rising while sending a message of patriotism and union. How do you feel when you see this cover? What is this cover telling you about the comic contents? Iwojima is a small Japanese Island which saw one of the most dramatic battles in the Pacific ocean: it lasted 40 days and it took the lives of thousands. The photograph of the Iwojima flag raising was taken the 5th day of battle on Mount Suribachi. It won the Pulitzer Prize for Photography and ultimately became one of the most significant and recognizable images of WWII. The picture was reproduced on newspapers, magazines, and even stamps. Marvel’s “Infinity” cover is recreating the environment of the photograph, putting into motion our shared emotions about it: we know that inside the comic pages a drama is going to unfold, and we’ll read the end in its pages. It will unite, and it will cost casualties. It will make us suffer. We’ll read about a titanic war of sheer proportions. We’ll read about devastation and heroes. It will make us identify further with the characters within while sense a weird sense of victory and loss. Because it recreates a key point in history, something that is in our subconscious mind, the cover will trigger not only emotions, but also actions from those who see this cover: some will be drawn to it and compelled to buy the comic book, even not knowing why they do so, others might even fear it. But there’s more in it that just triggering emotions: it also gives us clues about the story in it. There are two fronts opened in the war of the Avengers (just like the US had two fronts: one in the Pacific and the other in Europe). It also tells us that there are allies, a great villain that gets sees defeat along with a female companion (much like Hitler did with his lover), reconstruction (of Europe after WWII) with the help of the Avengers (the US aid program), and the seed of evil rooted and looming to come back. Marvel’s “Infinity” is a crossover storyline that ran from August to October 2013. I decided to read it only because of the “Iwojima” cover. I only ordered the previous numbers when I bought this one in my local comic book store (located in Barcelona, Spain) on July 2014. There were lots of them, getting dusty on one shelf. I didn’t give it much thought though, since I was too absorbed by the cover. That was “Iwojima.” I knew the photograph, I knew the history, I needed to read the comics: the story within was going to be dramatic, staggering and compelling. And yet: the comics were there getting dusty. But why? Why such a wonderful cover isn’t making its job? Because the cultural trigger is not present at all. Let me explain. I know the Iwojima picture by heart. Marvel’s cover was sure to trigger the desired emotions and actions from me because I share with the authors of the cover, Adam Kubert and Laura Martin, similar images into my head. Thus, the cover could trigger in me the desire to read the contents of the comic. However, the comic book store had lots of the same comics getting dusty on the shelves, meaning that the cover was not triggering anything remarkable on the occasional viewer. Perhaps the other covers did, but, it was devastating to see a lot of issues bored on a shelf. So, I decided to show the comic book around: specially the cover. Some people felt that they had seen, somewhere, a picture about it, but they didn’t know what it was about. Most people had no idea about it, and only one was able to point out it was about the WWII. Despite the photograph being internationally known, it has not integrated in the same way worldwide: for some the image has a lot of meaning, for others it’s just a curiosity, and some will just be totally blind to it. No surprise, then, Avengers “Infinity” Iwojima Cover comic books were getting dusty on a shelf in the local comic book store. What I find as a compelling cover, cannot trigger the “shared popular culture” it is referring to just because the “targeted viewers” aren’t there. While in the US the Iwojima photograph was printed and re-printed, even used on stamps, Spain was in the middle of a Dictatorial regime. The information that got through the lens of the regime was obviously poor and colored by the official political views. By the time Spain became officially a democracy in the late 70s, the power of the image was already into the subconscious mind of some around the world, but not in Spain, and not with the same power and psychological effects. You might see the image in school history books, but odds are that it will be just a picture, like the rest that might accompany the text. Only those who like history, or study, for some reason, something related with the United States, WWII in the Pacific area, or come across the American culture consciously or subconsciously taking it in as part of their selves, are able to recognize some of the shared american images. Every time you feel compelled or moved by an image, think that it might not have the same effect on viewers belonging to other cultures. If an image was internationally popular due to a major historical event, like WWII, does not guarantee that the image will have the desired effect on the viewers today. The source-message-channel-receiver is not working properly: the cover is unable to get the desired feedback from the spanish receivers. Simply put, the source, comic book creators, share a set of cultural images that do not accommodate the spanish receivers. Depending on who the audience is, and depending on the shared high and popular cultures, the comic book cover will or will not trigger desired emotions on the audience. Where the audience is from and what the audience knows will influence how the audience understands and feels towards the contents and delivery of the story.